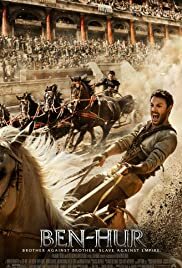 Director: Timur BekmambetovWriters: Lew Wallace, Keith R. ClarkeStars: Jack Huston, Toby Kebbell, Rodrigo SantoroSummary: A Jewish nobleman, Judah Ben-Hur, and his adopted Roman brother Messala are best friends despite their different origins. Messala enlists in the Roman army and fights in the Roman Empire's wars in Germany. Ben-Hur also develops feelings for the family slave Esther although their different station in life compels him not to pursue her. But when her father Simonides seeks to marry her off to a Roman, Ben-Hur declares his love for her and takes her as his wife. Three years later, Messala returns as a decorated Roman officer. His return coincides with a rising insurrection by the Zealots, Jews who are opposed to the oppressive nature of Roman rule..